The Pulaski Middle/Senior High School’s Bullies 2 Buddies Parent Group hosted a spaghetti dinner and a very special screening of the movie “Bully” for students and their parents/guardians recently. 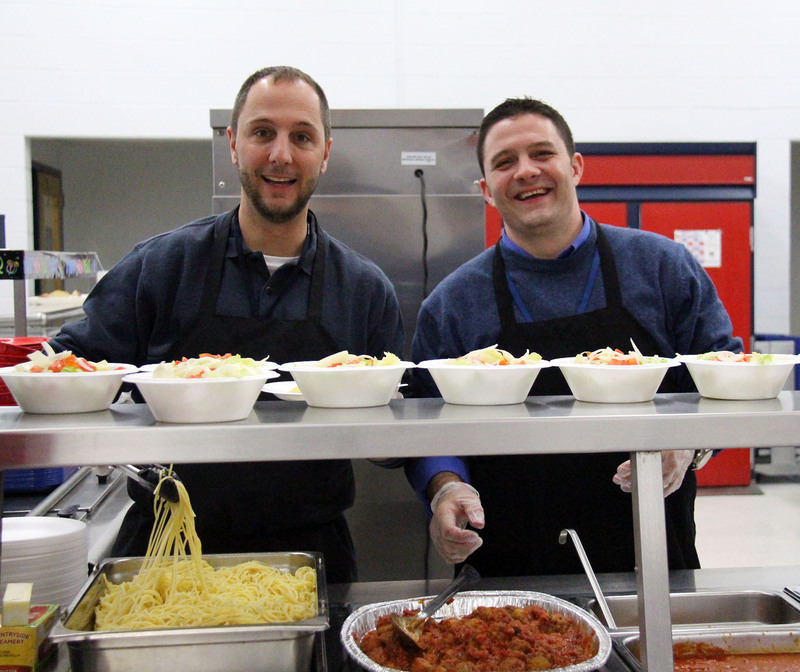 Pulaski Middle School Principal Michael Bateson, left, and High School Principal Jay Altobello serve up some delicious spaghetti dinners during the Bullies 2 Buddies program at the school. The spaghetti dinner served up delicious spaghetti, meatballs, salad, bread and desserts for those attending. The small fee for the dinner included entry into the movie. After eating, participants moved into the auditorium where High School Principal Jay Altobello and Middle School Principal Michael Bateson spoke to those attending about procedures and policies for dealing with conflict and bullying at the school. Very different from the districts pictured in the movie, Pulaski’s approach to bullying is simple and direct: it will not be tolerated, period. The film “Bully” is a documentary that follows several young people and their families who have suffered bullying and in some cases took their own lives as the result of the overwhelming physical and psychological abuse suffered at the hands of their peers and classmates. Following the, at times, difficult to watch harassment of the main characters in the movie, coordinators handed out information sheets to those attending to keep the lines of communication open between parents and their children. 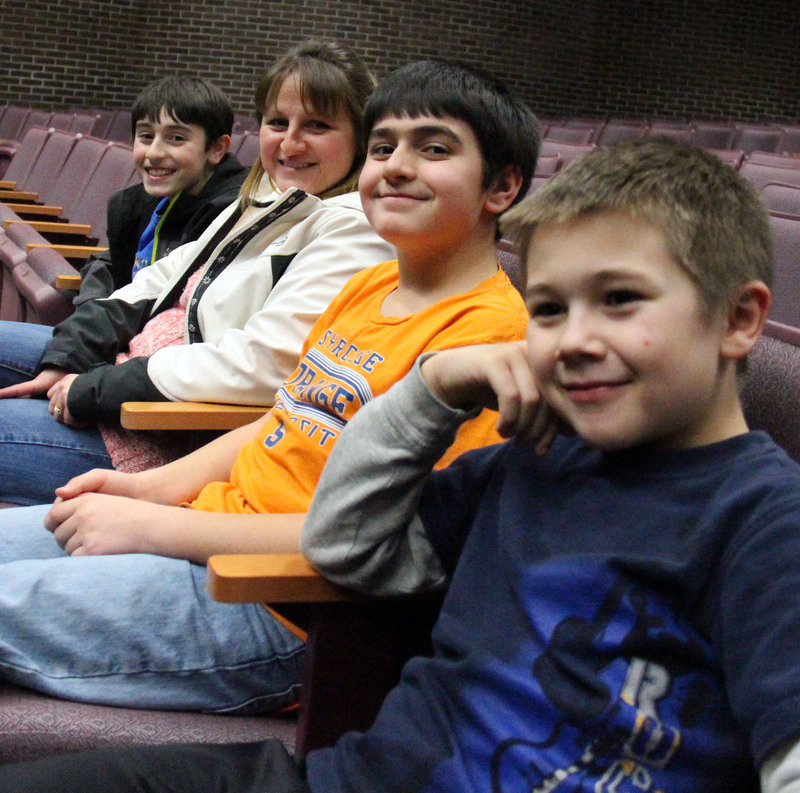 Settling in to watch the movie “Bully” with family and friends are left to right: Logan Penizotto, mom Cathy, brother Aydan, and friend Seth Gray. The movie was a special presentation by the Bullies 2 Buddies group at the Pulaski Middle/Senior High School. Information shared included action steps that could be taken in the event of dealing with a bullying situation, witnessing a situation where a fellow classmate is being bullied, or if you suspect your child is being bullied. The program’s facilitators also talked about ways to increase communication, monitor behavior, facilitate positive social experiences, promote responsible online behavior with students, and ways to bring about and model positive change.